Honor Play is official: Specs, price, and everything else you need to know! Honor Play: Who says you have to break the bank for a gaming phone? Gaming phones are now a thing, and they all have a few things in common: They come with some killer specifications, and they all cost a bunch of money. It makes sense, right? For a gaming phone with all the bells and whistles, you should expect to pay flagship prices for all that hardware. Honor doesn’t think so. The new Honor Play is finally here, offering high-end specs, a solid design, and a price point that’s under $300. Here’s everything you need to know about the all-new Honor Play. As you’ll find in the Honor Play’s official spec sheet, this phone is packed with some really high-end specs for the price. Not only does it come with the HiSilicon Kirin 970 SoC (the same chip that’s in the P20 Pro and Mate 10 Pro), there’s also 4 or 6GB of RAM. That alone should make this phone more than capable enough to run graphic-intensive games, but Honor is also touting its GPU Turbo tech with the Play. On smartphones with GPU Turbo enabled, Honor claims this feature will boost GPU efficiency by up to 60 percent, diminish single-frame SoC energy by 30 percent, and reduce power consumption by 15 percent. During our full review, our own Abhishek Baxi claimed that playing PUBG Mobile on the highest graphics settings was a breeze — the phone barely stuttered. The jury is still out as to whether or not all of the metrics Honor is touting are legitimate (we’ll test it out more in the future), but for now, the idea of a low-cost gaming phone that can run PUBG on the highest graphics setting is exciting. One more thing on GPU Turbo, if you’re not playing PUBG Mobile or Mobile Legends: Bang Bang, it won’t do much for you. GPU Turbo is only compatible with two games right now, but Honor says more will be added in the future. Let’s cut to the chase: One of the best things about this phone is the price. Starting at 19,999 rupees (~$286), this is pretty much the most affordable gaming phone on the market. That’s just for the 4GB model. You can also purchase a higher-end model with 6GB of RAM for 23,999 rupees (~$344). The Play’s competition is priced similarly, but there are more compromises depending on what you’re after. The Xiaomi Mi A2 costs around $290, but you’ll have to pay upwards of $400 if you want 6GB of RAM. The Nokia 7 Plus is one of the better mid-range phones out now, and it not only costs almost $400, it comes with a slow processor. The Vivo V9 costs a bit cheaper at $360 but comes with many more compromises than other phones in its price range. Plus, none of the other phones I just listed are focused on gaming. Right, it doesn’t. You won’t find any fans, extra lights, or — let’s face it — tacky design cues on the Honor Play. Unfortunately, the phone goes a little too far in the other direction. It’s pretty unoriginal. It has a vertical dual-camera setup on the back, a notched display, and a chin with a big Honor logo on it. If you don’t need a phone that stands out, you should have no problems with the Honor Play. Elsewhere, the phone’s design has a couple more compromises. While it does retain the 3.5mm headphone jack and USB Type-C port, it only has a single bottom-firing speaker. That means you won’t get the best audio experience while playing games, but at least you’ll be able to plug in your headphones without a dongle. The Honor Play is available globally on the official Honor website, and Amazon in India is selling it for ₹19,999. Find out even more about the Honor Play at the links below. Honor Play review: Again, don’t miss our full review. Seriously, you’re reading an announcement post instead of the full review? 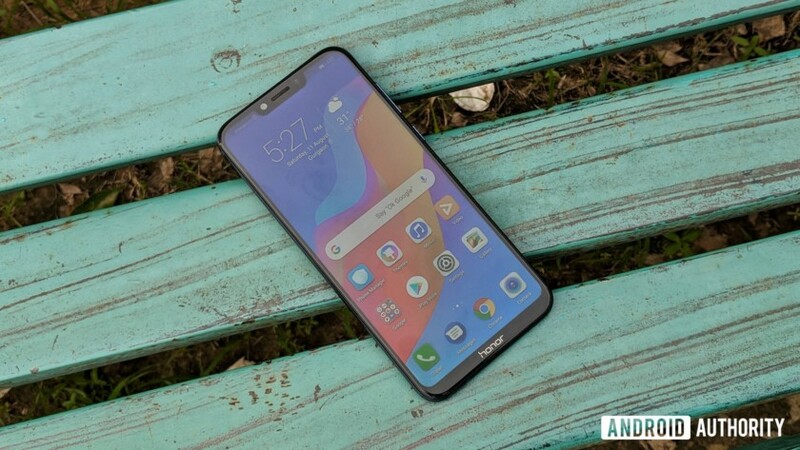 Honor Play specs: Head here to see the full, official list of Honor Play specifications. Honor Play pricing and availability: Looking to buy one of these bad boys for yourself? Check out this post to see how much it costs and where you can buy it.